This gorgeous GIA Certified ring features a 2.86 carat oval cut Forest Green Sapphire center, surrounded by a halo of round white diamonds. Each side shank features 3 half moon diamonds of descending size, decorated with detailed milgrain work. GIA Details: The center stone is Oval, Transparent Blue-Green color, with a geographic origin of Thailand. There are no indications of heat treatment. Ring size 6.5, with room to size up or down. This ring can be professionally sized to your specification at no charge, following your purchase. 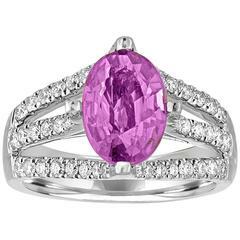 Center weight: 2.86 Carat Diamond weight: 0.87 Carat Set in 18k White Gold Many of our items have matching companion pieces. Please inquire. The GIA certificate will be provided upon purchase.